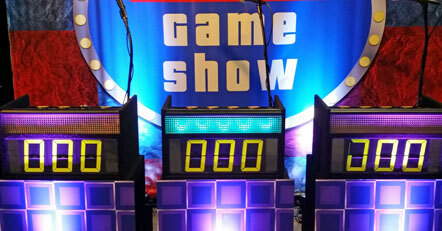 You've watched Jeopardy, Family Feud and other TV game shows for years. Often times, viewers of these shows say to themselves "these questions are easy, I should be on that show"! 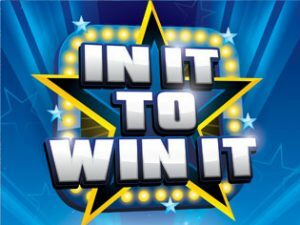 Well, step up to the plate, because the Game Show Connection has just the thing you have been waiting for! 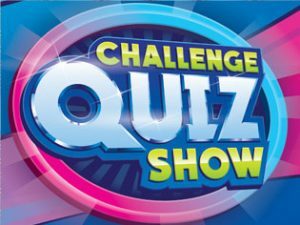 We bring the studio production of these classic TV game shows to your event - complete with digital scoring, lighting, sound effects and a professional game show host. 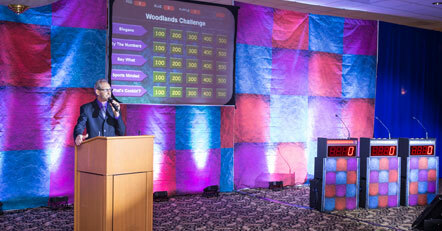 Our custom game shows can include fun, entertainment trivia, such as music, movies, sports and TV trivia. 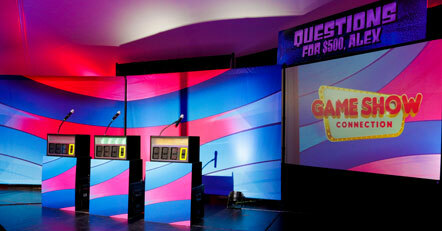 We also produce training game shows, where the trivia is customized to meet your company's needs. 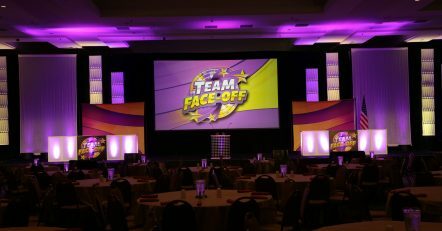 The popularity of TV game shows has created a significant demand from corporate clients for game shows at company picnics, banquets, holiday parties and training sessions. 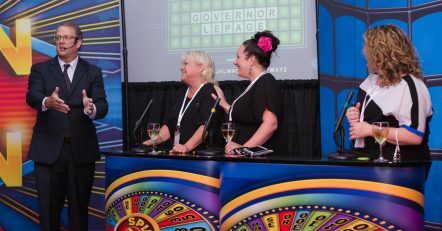 Our customized game shows are designed to promote communication, energize teams, stimulate problem solving and build morale. 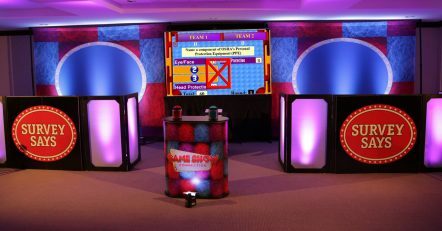 Over the last twenty years, we have continued to develop and improve our game show systems, so that your team members feel like they are entering a mini TV studio set. "The set was amazing! Super professional and looked like a real game show. I would highly recommend them to anyone looking for a fun, team building event." 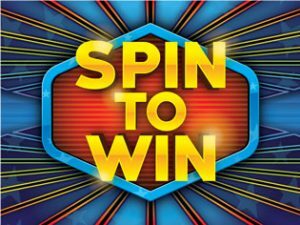 "I looked into a ton of other vendors but chose Game Show Connection in the end and so glad I did. 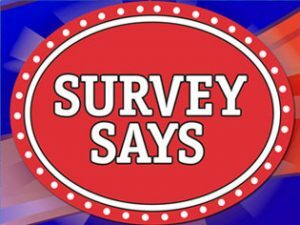 I HIGHLY recommend the whole Game Show Connection team and would definitely use them again." 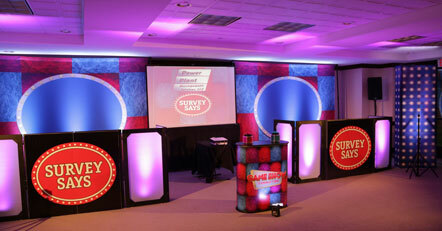 "The set was visually exciting, their game show hosting was engaging, fun, professional and I highly recommend them." 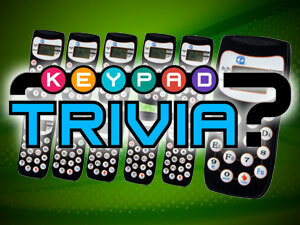 "Very helpful developing trivia questions specific to our company and making a fun training retreat. 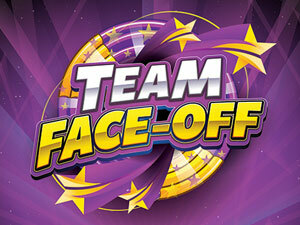 Our team members are still talking about the game show!"